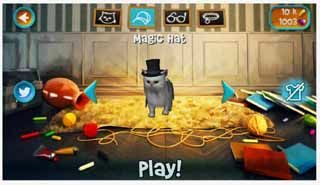 Free download Cat Simulator for Android with APK file. Download Cat Simulator new version from the direct link. Cat Simulator 2015. The most beautiful and realistic Cat Simulator available on the Google Play. Play as a real cat, explore huge houses and awesome gardens. Choose different cats and dress them as you like and of course, annoy the humans. There are nine locations. First, awesome house were you smash some objects and learn the game. Second, nice garden with a dog and people to annoy. Third and fourth are two huge floors in the second house with tons of stuff to destroy and play with. Fifth is a crazy garden with a barbecue party. There is also the street where you can check out the neighbourhood. The last three locations are in the third house with two floors and huge garden with interactive pool and awesome missions to complete. When you press Tap to play button in the menu you always go to the scene where you can change your cat and dress it as you like, using blue arrows on the both sides of the cat and buttons on the top of the screen. You can use the joystick, on the left to move your cat, jump button on the right to make it fly and swipe to look around. You can use the hit button on the right to smash objects with your awesome cat power.